America really is another country. Having only recently discovered bribing elite colleges to accept children of the rich and famous was illegal – I thought it was the done thing; and aren’t the rich just college donors-in-waiting? – we today learn that dogs are only allowed to ride the NYC Subway if they fit in a bag, Tupperware pot or coffin. The rule states: “No person may bring any animal on or into any conveyance or facility unless enclosed in a container.” The container is, presumably, less to keep your dog box-fresh than to prevent the pet from fouling the carriage, causing a nuisance or getting lost. 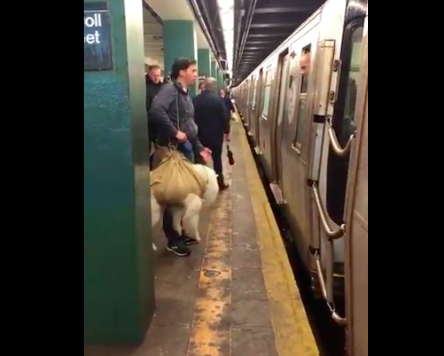 This man put his big dog in a small bag and attempted to board the train. New York sure has changed. Once upon a time, pretty much anything went and an obedient dog with large teeth would have been a useful ally on the Subway.